After an incredible European outdoor Championships in Berlin, high jump and pole vault are evidently in vogue right now as a new star of world athletics was born. As the crowd sat stunned in their seats, 18-year-old Armand Duplantis brought the roof down of the Olympiastadion with an awe-inspiring 6.05m jump to shatter the European Championship record. With the Swedish starlet set to make his mark on men’s pole vault for the foreseeable future, why not reminisce about some of the incredible moments that have taken place at the European Indoor Championships from our vertical jumpers? The Preston pole vaulter may have scooped bronze at the 2018 European Championships, but Bradshaw (née Bleasdale) made her name by becoming the first British athlete in European Indoor history to win gold for Great Britain in her event. Fresh from scooping bronze at the World Indoor Championships the year before, the then 21-year-old entered an enthralling jump off with Poland’s Anna Rogowska with both athletes failing to clear 4.72m. 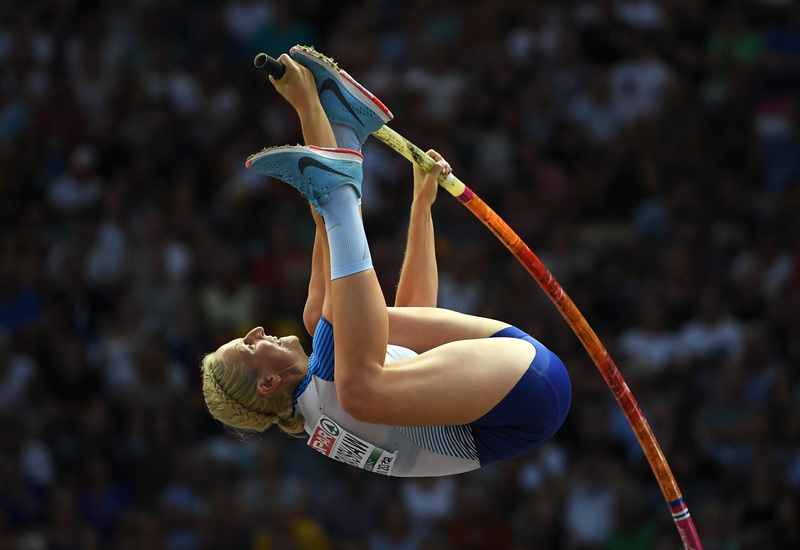 In the ultimate case of winner takes all, the British athlete cleared 4.67m and had to agonisingly wait to see if her Polish competitor could vault higher. With lady luck on her side, Bradshaw reigned supreme to win her first senior gold medal at a major championship. Few athletes have electrified the sport of pole vault as much as Russian great Yelena Isinbayeva. Back in Madrid 2005, the then 24-year-old created world and European Indoor Championship history by smashing her own world record with an outstanding 4.90m vault. In a career that saw the Volgograd-born athlete go on to clear 5.01m in 2012, Isinbayeva delighted the Spanish crowd by smashing the championship record as silver medallist Anna Rogowska watched on in amazement. A height still yet to be bettered at the European Indoor Championships, could 2019 be the year that Isinbayeva’s record finally tumbles? In a vintage year for vertical jumping sports at the European Championships, Swede Stefan Holm set a new championship record in high jump. Two years after winning successive World Indoor Championships, the then 28-year-old entered an intriguing showdown with Russian Yaroslav Rybakov for gold. Leaping 2.40m, the Swedish Olympic champion jumped to smash the European Indoor Championship record after failing to clear 2.42m and chase down Javier Sotomayor’s world record. 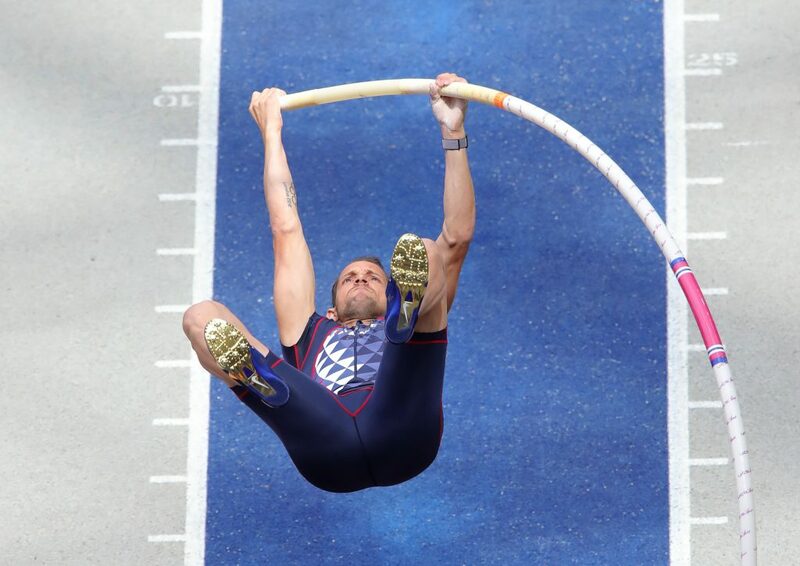 No athlete has been so consistent in the men’s pole vault in recent years as Frenchman Renaud Lavillenie. With Olympic gold already to his name at London 2012 and the world record in the bag after leaping 6.16m to smash Sergey Bubka’s 20-year record, Lavillenie rocked up in Czech Republic with the aim of securing a fourth successive European Indoor Championship crown. Blowing away the field, the 27-year-old had already clinched the championship record and gold when he cleared 6.04m, when he attempted and narrowly missed breaking his world record of 6.17m. Belgian high jump great Tia Hellebaut set records tumbling in 2007 when she broke the championship record, set a new national record, new personal best and a new world leading height with an outstanding 2.05m clearance to clinch European Indoor Championship gold. The Antwerp athlete leapt 9cm higher than Italy’s Antonietta Di Martino in second to claim her first and only European Indoor Championship title.